Dirk J. (Eric) Verschuur (1964) received his M.Sc. degree in 1986 and his Ph.D degree (honors) in 1991 from Delft University of Technology (DUT), both in applied physics. After 5 years of research fellowship, in 1997 he became assistant professor and since 1999 he is an associate professor at the DUT at the Laboratory of Acoustical Wavefield Imaging within the ImPhys department. Since 2016 he is the Program director of the Delphi research consortium (which is sponsored by 29 companies from the oil and gas industry), within which research is carried in the area of Geo-Imaging. His main interests are wavefield modeling, data processing, imaging and inversion techniques. In 1997 he received SEG’s J. Clarence Karcher award and in 2006 he was awarded with the Virgil Kauffman Gold medal from the SEG. He has been selected as the EAGE lecturer for the Education tour 2006 with a one-day course on multiple removal. 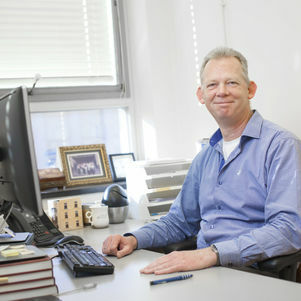 He has been co-promoter of more than 20 successfully completed Ph.D. theses at Delft University of Technology since 1997. Associate Editor of “Geophycis” from 2003-2013. Member of the editorial board of the “Journal of Seismic Exploration” since 2006. Member of the editorial board of the “Journal of Geophysics and Engineering” since 2015. In 2006 he was elected as the Distinguished Instructor for the 1-Day traveling course “EAGE Education Tour” for the European Association of Geoscientists and Engineers (EAGE); Since then, he has given this course at 20 locations throughout the world. Since 2006: Member of the EAGE Research Committee; 2013-2016: chairman of this committee. Since 2008: one of the two directors of the company ‘Delphi Studio for Imaging B.V.’.